We can hear wedding bells! The event of the year is tomorrow and we can’t wait. Prince Harry and Meghan Markle are set to wed this Saturday, May 19th at St George’s in Windsor Castle. Although we may not be getting a bank holiday; like we did for Prince William and Kate Middleton’s wedding, there is still going to be thousands of people celebrating the royal and prestigious day. But how do the British Public usually celebrate royal weddings? Unless you’re one of the lucky 2,600 people to get invited to the wedding, we wanted to help give you some ideas of other ways you can celebrate, if you haven’t started planning already. The ceremony is going to take place on May 19th at 12pm GMT (7am ET for several channels in the US). If you want to go all out for it, create some royal themed invites to formally invite your friends and family over – detailing all your party plans. 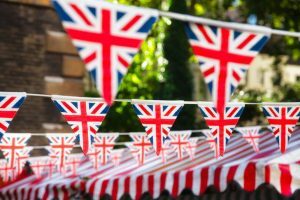 You can establish a dress code, decorate the house with the British flag, bunting, celebaratory festive banners, photos of the royal family and of course food! 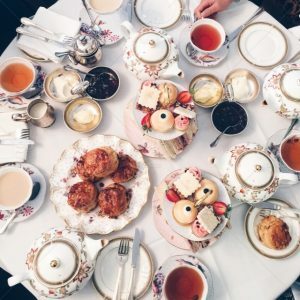 Think tradional foods such as finger sandwiches, scones, tea or punch and victoria sponge cake. Street parties usually take place across the UK which brighten up the street with all their decorations and the unanomous excited feel of the day. It’s the best way to join in on the fun with your neighbours and community. Street parties usually consist of music, food, drink, games and of course the broadcasting of the ceremony. It’s reported that local authorities have abolished road closure fees, but double check with your local council before you throw one so you’re aware of other processes like licences for food and alcohol. The pub is a classic way to watch any event; whether it’s boxing, the races or the football – which will be broadcasting on the same day as it’s the FA cup final! Going to the pub you easily avoid all the hassle of throwing your own event and you can sit back, have some pub grub with a drink whilst you watch the ceremony. 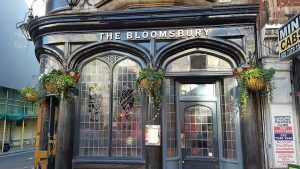 Pubs are open longer than usual on May 19th and instead of the usual closing time of 11pm, the license has been extended to 1am so you can celebrate for longer! If you’re out celebrating in any of the ways above or you are celebrating in your own unique way we would love to see it! We have a video brief open where you can submit your videos of all the trimmings. If your video sells, you could earn some money – see below for inspiration which also went on to sell. Happy Planning and congratulations Harry & Meghan!